If you have remote users who connect via VPN, and a policy that forces them to change their password periodically, this can result in them getting locked out without the ability to change their password (externally). 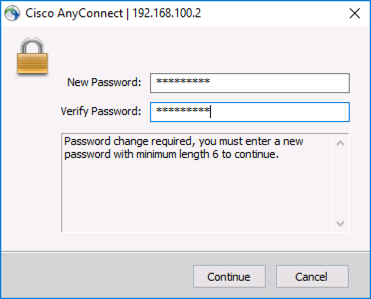 If your Cisco ASA is using LDAP to authenticate your users, then you can use your remote AnyConnect VPN solution to let them reset their passwords remotely. Standard LDAP runs over TCP port 389, to allow the ASA to reset the password for the users, it needs to be connected via LDAPS ((TCP Port 636). Your AD server needs to be able to authenticate via LDAPS, by default it will not. I’ve already covered how to set that up in another post see the following article. 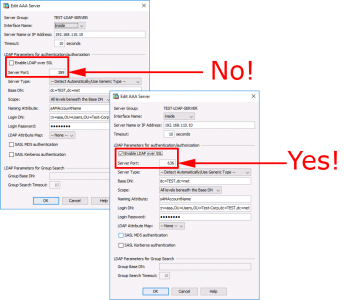 So, assuming your AD server(s) that the Cisco ASA is authenticating against is already setup, you need to ensure that your AAA Settings for LDAP is set to use port 636. 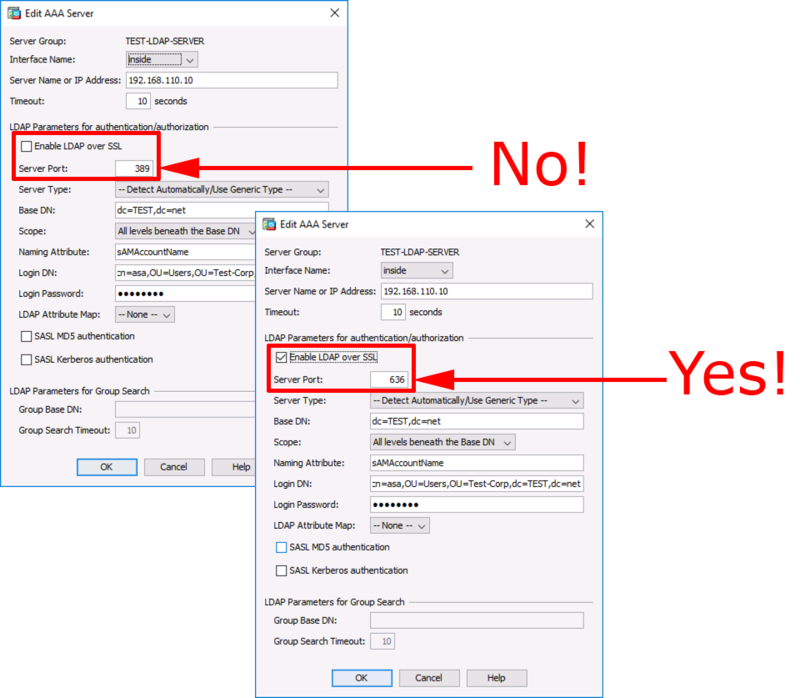 On my test network I only have one LDAP server in my LDAP AAA group, you may need to repeat this procedure for each one in yours. 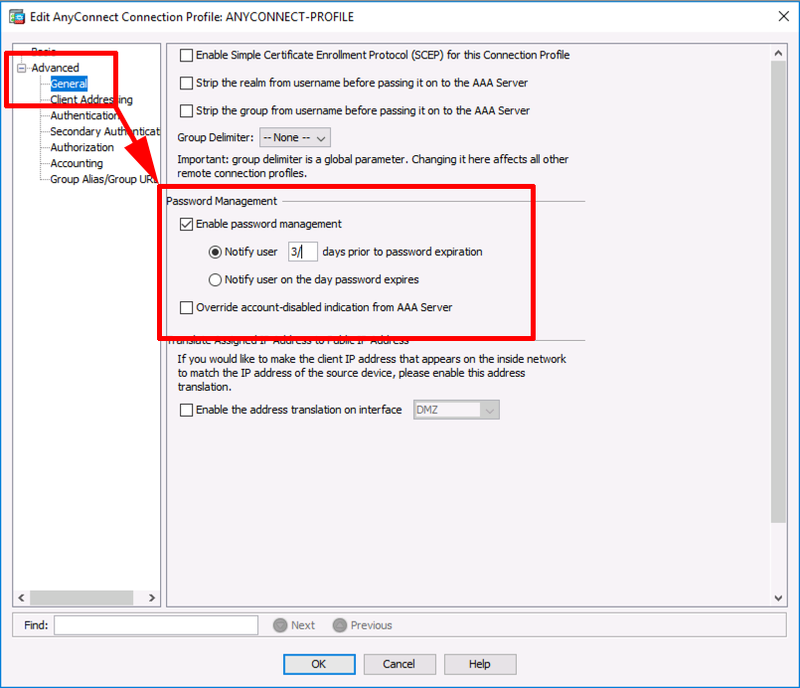 Log into the ADSM > Configuration > Device Management > Users/AAA > Select the LDAP Server Group > Select the Server > Edit > Enable LDAP over SSL > Server Port = 636. 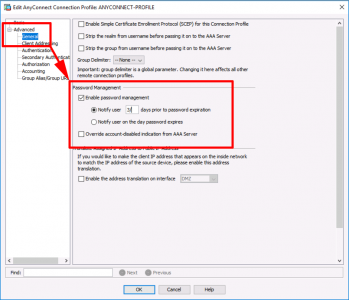 Next you need to edit the AnyConnect connection profile to allow password resets. Or the tunnel-group if you work at command line. Connect to the ADSM > Configuration > Remote Access VPN > Network Client remote Access > AnyConnect Connection Profile > Select the one for AnyConnect > Edit > Advanced > General > Password Management > Enable Password Management > Select to notify user the amount of days before his/her password expires > OK > Apply > File > Save running configuration to flash. Now your users have the ability to reset their password remotely as they are about to expire, and when they have expired.